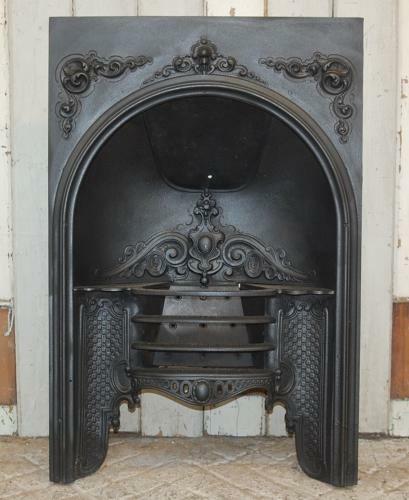 A stunning, highly decorative, original early Victorian cast iron hob grate fire insert. The fire has a large arched opening and built in grate for burning. The fire has beautiful decorative features, with acanthus leaf design above the grate and similar smaller design at the top of the fire. The fire has the traditional warming plates on either side of the grill, with the same leaf pattern. Below the warming plate the fire has a repeated pattern on the legs and the fire retains the original curved front bars. The fire has the original top plate, however it does not stay firmly in place and will need to be secured by purchaser. The iron has been blacked and polished. The fire has a kite registration mark but it is broken and fairly difficult to read, however the left hand mark is a letter, rather than number (G-February) and items with letters to the left, referring to the month made, were dated between 1842-1867. The kite mark is featured in 2 areas on the back and the top plate has some other script style numbers. The hob grate does have some damage due to age but is ideal for decorative use. The top plate will need securing by purchaser. The back has surface rust as expected. The back support leg has broken off and has been retained for possible repair by purchaser. Part of the kite dating mark is also on the top of the leg. The top of the back plate has cracks on either side of the smoke hole but the fire is fairly strong and sturdy. Some marks, scratches and wear can be seen. The fire has a stunning appearance and would make a wonderful statement within a period home. The hob grate is a fine antique fire and the intricate design and its large size makes it a very desirable item.